We have a new project! 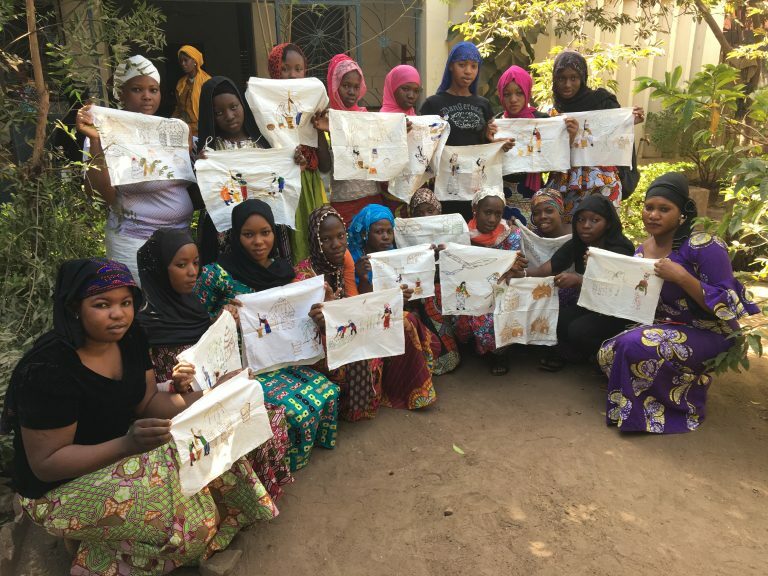 Quilt for Change and The Advocacy Project (AP) are pleased to announce the launch of an exciting new partnership between survivors of gender-based violence (GBV) in Mali and quilters in the United States. 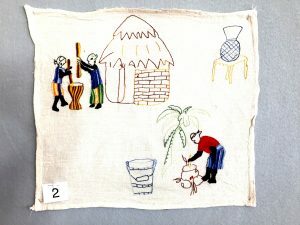 The Project: Under the initiative, known as Sister Artists, GBV survivors have produced embroidered blocks depicting scenes of life in Mali. Quilt for Change is inviting American quilters to turn one of these blocks into an art quilt which will then be posted online, exhibited and auctioned. All proceeds from the auction will be sent to Mali and invested in a micro-enterprise for the artists. Exhibit: The collection of art quilts will be exhibited at a brief exhibit or event in Washington DC in the fall of 2019 before an online auction. Details about this exhibit will be shared when available. To Enter: To select your block and enter, go to the The Advocacy Project website and fill out the registration form and pay the $25 Entry Fee (payable to The Advocacy Project), including the number of your preferred block. There are a limited number of blocks (39) and they will be distributed on a first come first served basis, so enter soon to get the block of your choice. There are no size restrictions on your completed quilt. Grand Prize: The creative mission is to stitch an artistic setting for the embroidery created by your Sister Artist from Mali. Hollis Chatelain, whose exhibit Stories of West Africa is traveling the US, has agreed to select one quilt for special recognition, and that artist will receive a beautiful bundle of fabric from West Africa. When asked what criteria she would be looking for, Hollis answered, “the quilt which best supports and raises up the art of the Malian women’s embroidery.” What better way to send a message to these women that we believe in them and their artistic future, than to highlight their artwork? 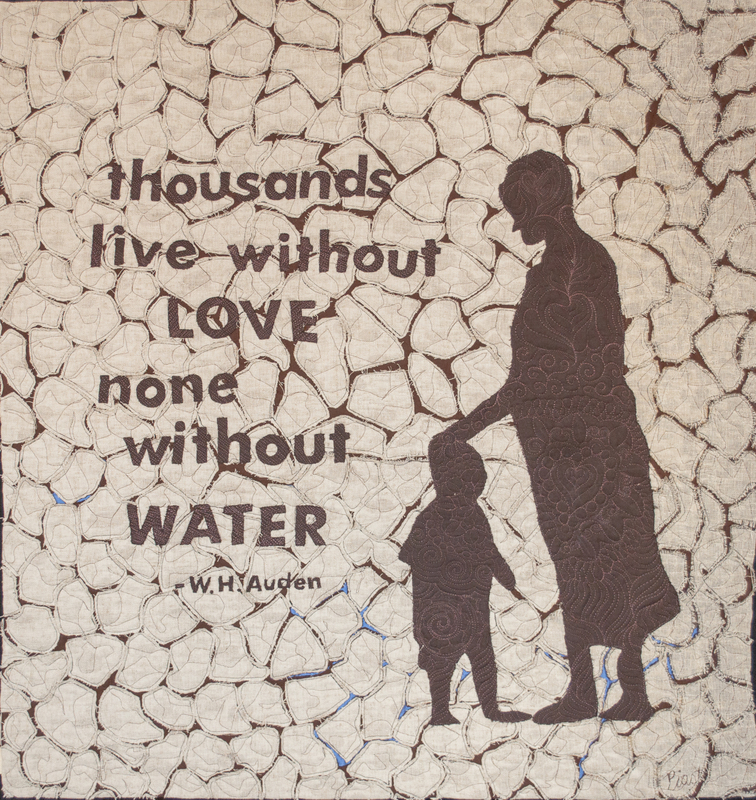 For more information on the Sister Artists project and to learn more about entering, visit http://www.quiltforchange.org . Thanks for your interest and look for updates on this great effort in the near future. 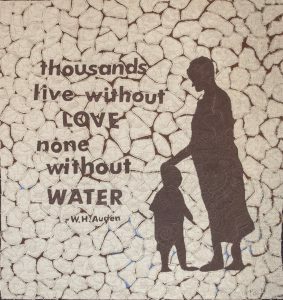 The last exhibition of Water is Life is currently on display in Union, New Jersey, at the Kean University Human Rights Institute Gallery from September 4-December 12, 2018. Gallery access is free and open to the public, and the Institute is happy to arrange group tours for guilds and school groups. To schedule a tour, email humanrights@kean.edu or call (908) 737-4672. Kean will host an artists’ panel discussion and reception on Thursday, September 27. During the panel discussion (3:20-4:30 pm) Allison will speak on using art quilts to advocate on social issues and will be joined by a few of the 39 artists to discuss their motivation and inspiration in creating their quilts. A reception will follow from 5:00-7:30. Attendees are asked to email the Institute at humanrights@kean.edu to account for numbers of attendees, and to park in the the university visitors’ parking lot (see this link and follow the red line: https://www.kean.edu/~gallery/Directions.html). The exhibit runs through December 12. Quilters and members of the public are welcome to visit the Kean campus to view the quilts during gallery open hours, which are posted on the human rights gallery webpage, www.kean.edu/~gallery/humanrightsgallery.html. Luana Rubin interviewed artist Hollis Chatelain at the Houston International Quilt Festival about her work, about water issues, and about using her voice through her art to raise awareness and bring about change.